Roland’s love affair with drum machines started with the Rhythm Ace R-1 back in 1964, then progressed through to the 70s and the legendary TR-77 rhythm box. On the eve of the 80s, it was Dr Rhythm the mighty DR-55 and then the unmistakable sound of the iconic TR-808 Rhythm Composer. Roland innovation continued with the Groovebox series of futuristic beat creators and into the 2000’s with Dr Rhythm and Groovebox but it’s the 808 which sticks in the mind of so many musicians. In 2014, the AIRA TR-8 Rhythm Performer took the best features of the TR-808 and the TR-909 and made something really special. 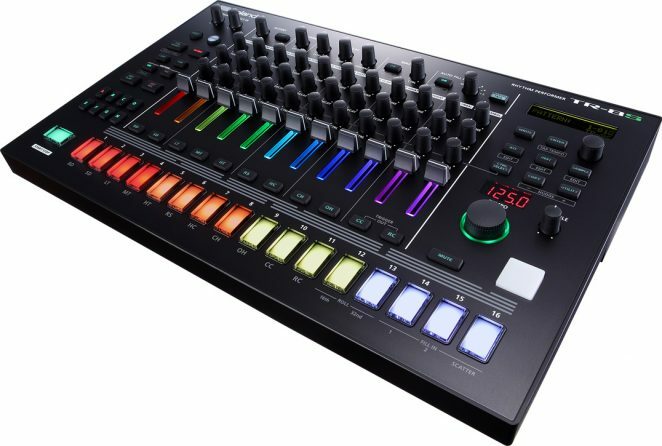 Today Roland are thrilled to unveil the TR-8S, an updated take on the AIRA TR-8 drum machine. You can program on the 16 TR-REC buttons or use the velocity-sensitive performance pad to play live, or record into the sequencer. And you can move seamlessly between either, playing and editing – reshaping your drum parts without ever interrupting your flow. Create intricate grooves and detailed fills using velocity, accents, flams, and adjustable sub-steps for modern rolls and ratcheting. Get experimental with unusual polyrhythms and complex meters by adjusting the length or “last step” of each drum part. Well-placed fills can create thrilling moments in a track or a live set. Each pattern in the TR-8S can contain two fills which you can customize or create from scratch. There’s also an adjustable “Scatter” fill which will slice and dice a measure into short bursts of cool and controlled chaos. But at times, your hands may be too busy to trigger every fill manually. That’s where Auto-Fill comes in. Automating fills every 2, 4, 8, 16, or 32 measures keeps your hands free, but also adds interesting dynamics to your performances.